Miso has a depth of flavour that’s sometimes hard to find in some vegetarian foods and, while I would have described it as emphatically savoury, the flavour is milder in some varieties than others. So mild, in fact, that I found a great article in the New York Times that includes a recipe for miso butterscotch sauce. I was going to call this post ‘Miso Tasty’, thinking I was being all clever and shabby-grammar in the manner of ‘I can has cheezburger’. Turns out that there’s actually a start-up company with this name. This was disappointing from my own ‘haha, I am so hilarious with my mildly amusing title’ point of view. However, it does mean that there’s a splendid resource available outlining the incredible health benefits of miso in a far more detailed manner than I could ever hope to achieve. Miso Tasty, take a bow! (And good luck with your venture – the world will be a better place when everyone loves miso). Miso soup is a doddle to make (recipe below). If you’re busy, the packet soups can be pretty good too. All you have to do is boil a kettle and you have a great soup for a starter before meals or a savoury drink during the day (makes a nice change from tea). We use miso for loads of other things too – it’s great in sandwiches with peanut butter, tahini or tofu and some spinach or salad leaves. It’s good to add to soups and stews if you want to deepen the flavour. It’s fabulous in stir fry sauces and salad dressings. 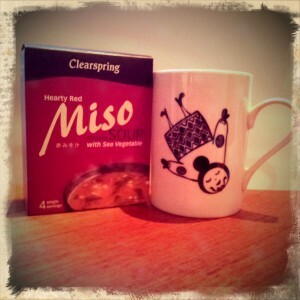 There are loads of great recipes online – try these from misorecipes.net for starters. We’ll just provide the basic, super-simple, mega-tasty beginners recipe here: miso soup (aka heaven in a bowl). With tofu and noodles, this has low fat protein and carbs too so it’s a substantial dish in itself. If you want to serve it as a starter, just leave these out. 1 Cook the noodles according to the instructions on the packet, refresh with cold water and leave to one side. 2 Boil 1 litre of water and remove from the heat. Mix the miso with a cup of the hot water to make a paste and then stir this into the pan of water. (A teeny bit of faff but this stops lumps forming). 3 Add the tofu. Put the lid on the pan and let the tofu heat through for a couple of minutes. 4 Add the cooked noodles and all of the other ingredients. Serve immediately. Love Miso soup. Yay to this!